Jim Creighton was an American baseball player known for inventing the fastball. He is considered baseball's first star. 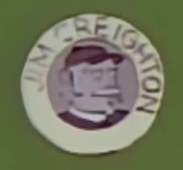 Mr. Burns wanted Jim Creighton to join his softball team. When Smithers found it out he told Burns that his right-fielder, which was Jim Creighton, had been dead for 130 years. Modified on August 3, 2013, at 17:51.